If you wrote a post on this or any of my other discussion topics today, Monday June 17th please leave your link in the Mr. Linky. For the first time this year I’ve done a ton of listening while doing yard work. When I started listening to audiobooks we were in a condo, so there was no yard work to be done, and when we moved into our house last summer I was pregnant with twins, so I was not so much with the yard work. This summer, though, I waged war on the dandelions in my yard and about two weeks of my life were given up to yard work, which meant I got through LOTS of audiobooks. I also recently got a fitbit (a fancy schmancy pedometer). The thrill of being able to compete against myself and others to get steps in has me taking lots of walks, and when I’m by myself or just with the babies I always, always, always have my audiobook going, which means more listening time lately. So that’s my audiobook year, how was yours? I don’t get to do much gardening, but can imagine your yard is looking great since you have your audiobooks to keep you company. I haven’t listened to any of your favorite titles yet, though I’m looking forward to catching up with Memoirs of an Imaginary Friend and Parlor Games. 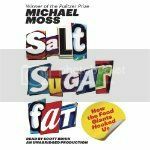 Thanks for hosting Audiobook Week once again! It’s an event I look forward to every year. Thanks to you, Jen, I got hooked on audiobooks since I read your posts during the Audiobook Week last year! My love of audiobooks has gotten stronger and stronger and it’s now a regular part of my reviewing schedule. I am writing down all these titles – I have a feeling my audiobook TBR is going to grow by leaps and bounds this week! I second your yardwork/audiobook recommendation:) I get through a lot of mindless work via audiobook. Last week I finished Gods of Gotham as an audiobook and really enjoyed it. I also listened to Blood, Bones and Butter (chef memoir) while prepping for a big dinner. Perfect! I’ll be downloading your suggestions. First, thank you for hosting Audiobook Week – this is my 3rd time participating and I look forward to it each year!!! I haven’t listened to any of your favorites – but the Emma Donoghue one has caught my eye so I will be looking into that one! Don’t you love the friendly competition of the Fitbit? I’ve had mine now for almost a year, and it wasn’t until I joined Twitter that I found fitbit friends. It just makes you do more – and I love the idea of getting more walks in while listening to audios! I am just finishing one on my iPod and will need to get some more – I’m thinking by the end of the week I should have a nice list to work off of! 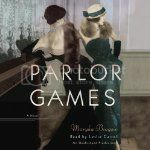 I’m adding Parlor Games to my wish list. If Astray is half as good as Room, it belongs there, too! 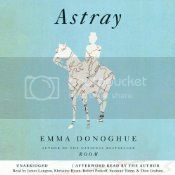 I still haven’t gotten to Room, but Astray is a fabulous collection of historical short storied. You know, I’ve been wanting to listen to Memoirs of an Invisible Friend for a while. The funny think is, I think I have checked to see if it’s available at my library like 5 times, forgeting I already have. Sadly, it’s not, so eventually I will figure out some other way to procure it. I’ve been hesitant to get a pedometer, because I still try to convince myself that walking isn’t excersise and I worry if I go that route it will become like a chore for me. I have to walk a lot for work, and am on my feet like 7 of the 9 hours, but I always wonder just exactly how much I do walk everyday. I haven’t read any of your 5 favorites so looks like I’ll have to add them to the list Thanks for doing this awesome audiobook week! I’m so excited to participate. For some reason I feel strange listening to audiobooks when I’m around my daughter so I don’t listen very often at home unless she’s sleeping (even on walks we listen to the radio together rather than me being plugged up with headphones). Makes me nervous about the audiobook time I’ll be missing out on while I’m at home with the baby! I agree that it’s been so much fun seeing audiobooks explode over the past couple of years. My 3yo cut her hair last time I tried to listen to audiobooks at home when she was awake… but my 8-year-old son is a big fan, and we both love to listen, especially in the car. Thanks for hosting this! What a great week it’s going to be! I finished up an audiobook this morning, and now I’m trying to figure out which book to listen to next! Thank you, thank you, thank you for recommending Astray! I loved it so much. 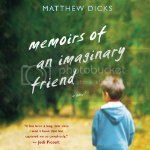 I also really enjoyed Memoirs of an Imaginary Friend. Now why didn’t I include that? 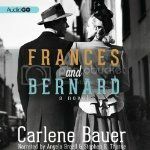 I read Parlor Games and Frances and Bernard in print, so I’ll keep those in mind for rereads. I need to do those more often. Thanks for the great event, Jen! Thanks for hosting this! I enjoyed it last year and am so looking forward to participating this year. Totally unrelated to audiobooks for me, but I love my fitbit! I treated myself to one for my birthday and I’ve really enjoyed it. I try to walk everywhere now! My Audiobook Year | my books. my life.